An interview from the 2018 International Broadcast Convention in Amsterdam with Nick Warburton of Symply. Symply is an innovative developer of high-speed digital storage solutions, designed for media professionals – from the single editor to an entire facility. In this interview Nick talks with us about the Industry’s First Affordable High-Speed Multi-User StorNext 6 Powered Thunderbolt 3 Storage Solution, the SymplyWORKSPACE. 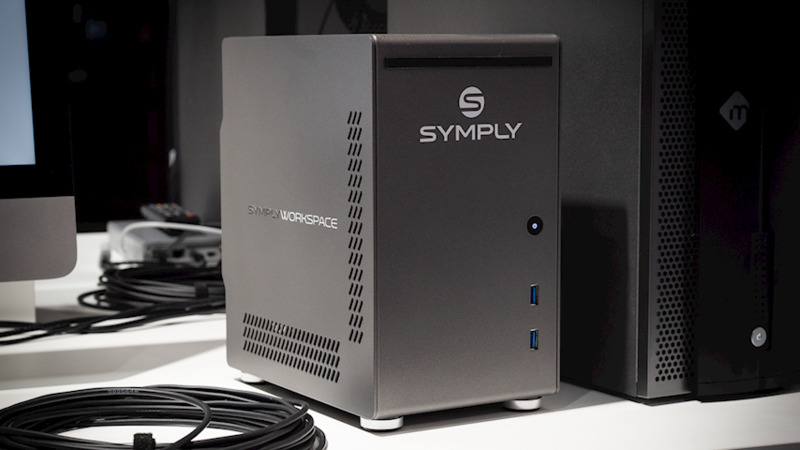 At IBC 2018, Symply a Global Distribution brand, showcased the first Thunderbolt 3 based SAN technology using StorNext 6 called SymplyWORKSPACE. The preview is designed to demonstrate the benefits and capabilities of shared Thunderbolt 3. With the high adoption rates of Thunderbolt equipped workstations and laptops being used in media production, being able to connect high-speed shared storage has been a hassle, requiring expensive and bulky adapters. This unique product allows laptops and workstations equipped with Thunderbolt 3 to ingest, edit, finish, and deliver without ever moving content locally, even at 4K resolutions with a direct Thunderbolt 3 cable connection, no adapter needed. Based on the industry leading Quantum StorNext 6 sharing software, users can reliably connect up to 8 laptops and workstations to the system using standard Thunderbolt with no additional hardware or adapters, and share video files, graphics and other data files instantly. One of the early limitations of Thunderbolt 3, has been the short cable length from storage to workstation. With the recent Corning optical cable technology demonstration, users can be tens of meters away from the SymplyWORKSPACE. While the company has not announced pricing or availability, the systems are expected to start under $10,000 USD for 48TB and 4 users, making the solution perfect for smaller post production houses in-house creative, house of worship, sports teams, ad agencies, and any creative user facility with more than one users looking for high-speed sharing at an affordable price. Also shown at IBC was SymplyULTRA, a truly complete collaborative ‘workspace’ – developed from the latest available technologies including proven Intel Xeon multi-core processors and a bedrock Linux operating system. The advanced architecture features a powerful software-defined virtualized RAID and application hosting environment that deeply integrates high-availability StorNext5 integration with nearly unlimited tuning and optimization capabilities. This powerful combination allows SymplyULTRA to deliver on the concept of the ‘complete collaborative workspace’ – an inclusive collaboration environment for Fibre Channel and Ethernet users. While ensuring truly seamless collaboration and connectivity – the system is absolutely designed for performance. With eight 16Gb Fibre Channel ports users can handle the demands of online 4K editing, while eight additional 10Gb Ethernet ports are provided for proxy editing, graphics, review and other lower bandwidth operations that are ideal for Ethernet. Broadcasters, film studios, post-production houses, and other media creatives will experience a new level of flexibility, efficiency, and workflow collaboration capabilities. Unlike many integrated storage solutions sold for media, SymplyULTRA is built on a proven enterprise hardware platform that offers true high-availability operation. SymplyULTRA delivers not just RAID protection, but redundant RAID controllers, redundant Metadata controllers and IP re-share servers, all presented in one compact 2U system. 4U expansion systems can be added to provide workspaces above 1PB. Workflow Storage deployment has never been easier than with SymplyULTRA - the highly-integrated platform is managed by an all-new application called SymplyRTM (Real-Time Management). SymplyRTM is the first workflow management tool that combines the setup and management of StorNext and all RAID management steps into a single operation. Users can simply deploy systems locally or around the world. SymplyULTRA is available in a range of configurations to meet a variety of requirements depending on performance, capacity and number of users – all backed by Symply’s storage and workflow experts and preferred integrators and resellers worldwide.